Photographed on the right in June, and planted 8.5 years ago in March, this 8 foot tall by 10 foot wide Manila mango tree is loaded with mangoes. The fruit becomes ripe in the middle of August, and this tree bore its first fruit 3 years after planting. This Manila mango tree was purchased locally and this variety is the most commonly available of all mango varieties, since they ship them in from Southern California. It has been frozen back at least 3 times, even though I attempt to protect it on the handful of winter nights that temperatures go below freezing. It is located on the west side of the house in the lawn, on the east side of a cinder block wall. Being located a fair distance, 9 feet, from the western wall of the house helps the tree avoid the baking reflected heat it would be exposed to if it was located closer. Shown below is a zoomed out view of the Manila mango (left) and another Keller mango tree (right), with a 6 foot wall in the background, that gives a better perspective on the size and location of the trees. Several inches of mulch are maintained around these trees. They were originally planted in the grass, but the mulch has killed most of the grass beneath them. Chemical nitrogen fertilizers are not used on these trees because it burns them very easily. However, regular applications of fish emulsion 5-1-1 and 0-10-10 are applied in warm months. They are watered by the sprinklers but are also occasionally deep soaked with the hose. Mangoes tolerate the lower desert heat very well as long as they have sufficient water. They are salt sensitive and therefore one must be very careful not to burn them with fertilizer. Freezing temperatures are hardest on young mango trees but as they grow larger they can tolerate temperatures slightly below freezing for short periods. supermarkets in the U.S. is a variety named Tommy Atkins, which is not one of the best, although it ships very well. So, many people are unaware how good a mango can be. Mango trees can be grown from seed, but like many fruit trees a seedling will not reliably yield a fruit exactly like its parent tree (unless it is from a polembryonic seedling, see propagation section below). For this reason, to guarantee the type of fruit you are getting you need to buy a grafted mango tree. This being said, I have found that you actually have a good chance of getting a tree with good fruit from the seed of a nice tasting fruit. Furthermore, seedlings are much more vigorous growers than grafted trees and given our marginal mango growing climate, that extra vigor can make a big difference. A good variety of mango tree, named Manila, can often be found in local big box stores in the Phoenix area. A cut fruit from my Manila mango tree is pictured on the left. Manilas are a South East Asian type mango and relatively long and thin and very sweet. Other varieties of mango trees are more difficult to buy here, but can be found at specialty nurseries or shipped in from Florida. Some very desirable varieties are Keitt, Kent, and Nam Doc Mai. 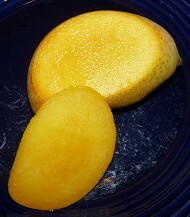 A cut Keitt mango from my tree is pictured below. Keitts are an Indian type mango and have a little more of a tart edge on them than Manilas, but they are still very sweet, especially when grown in the heat of the lower Arizona desert. The green mango pictured above (next to the overview heading), hanging on the tree, is also a Keitt. By clicking on that picture you can see a close up of the fruit and a photo of the tree. I have had this grafted tree for close to 10 years and it is still under 3 feet tall. It is in an area with a lot of root competition but I mostly blame this lack of growth on the fact that it is a graft. For this reason, I am starting to tell people that they should plant a seedling in Phoenix, because grafts just struggle too much here. 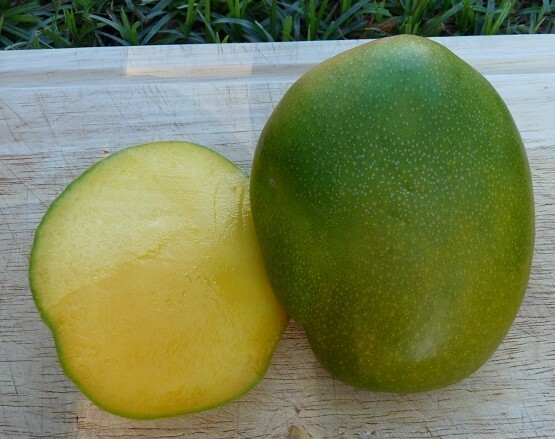 It is fairly difficult to tell when a Keitt mango is ripe because it will stay generally green, although it will get a little more color on the top, and lose some of its bluish hue becoming more of a straight green. Manila mangoes go from a yellow to more of an orange hue when ripe. Another way to see if a mango is ripe is to palm it in your hand and gently tilt it in relation to its stem. If it falls off into your hand, its ripe. 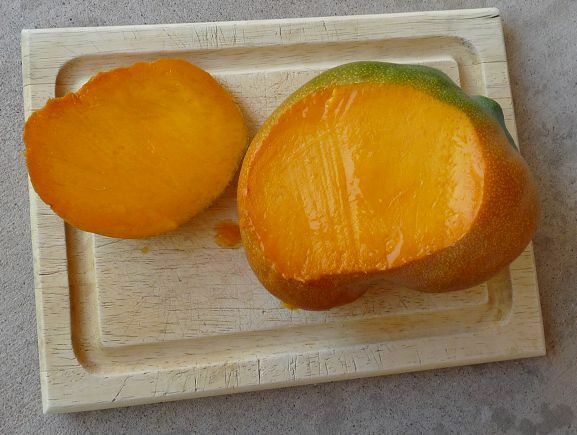 In the Phoenix area, both Manila and Keitt mangoes become ripe in the second half of August. One other significant difference betweeen Southeast Asian mango trees and Indian mango trees is how they hold their fruit. SE Asian mangoes will hold multiple fruit on each branch in clusters, while Indian mangoes tend to naturally thin themselves to only one mango per branch. Mangoes tolerate the lower desert heat very well and will grow continuously all summer. They like full sun but should still be kept out of reflected heat in Western exposure. For example, being next to a white wall in the heat of the day creates an oven like environment that almost no plant can take. In full sun, a mango's leaves will sunburn slightly during the hottest parts of the year, but this is generally not a problem. Fruit and the stems that hold the fruit can sunburn, especially if exposed to afternoon sun. This is more of a problem on smaller trees because they do not shade their own fruit as much. If you are concerned about your fruit getting too sunburned, paint the stem holding the fruit with a 50/50 mix of white latex paint and water. Later, when the fruit itself has reached about half its full size, tape a white paper bag around it. Leave the bottom of the bag open so that the fruit can be viewed. Being tropical, mango trees suffer when temperatures go below freezing. Generally speaking they are damaged when temperatures reach 29 F. The longer the temperatures are this low the more damage the tree will take. Larger trees can handle cold snaps better becuase the tree will freeze from the outside of its canopy inward, and larger trees have more canopy for the freezing process to work its way through. 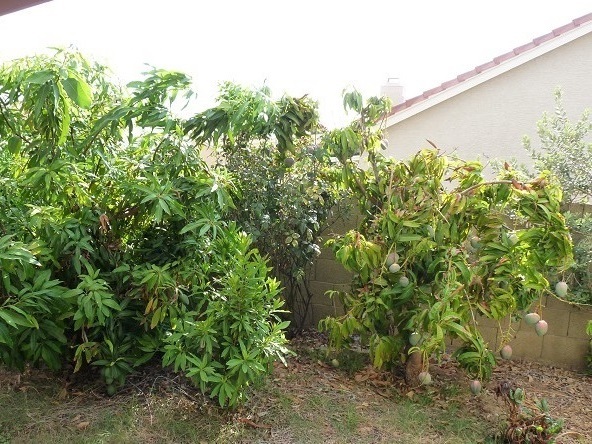 Therefore, mango trees are limited to neighborhoods in Phoenix with favorable microclimates. Planting trees near walls or houses can help them get through colder nights and small trees should be protected on the several frosty nights that typically occur from the middle of December to late February. Neighborhoods on the outskirts of town that are typically colder than the Phoenix metro area, such as Queen Creek and Cave Creek are generally too cold for growing mangoes. Dig a hole at least twice the size of the rootball. At a minimum, make the hole 2 feet in diameter and 2 feet deep. Back fill the whole with the same native soil that was removed. It also is a good idea to finish with the hole an inch or two recessed so that a watering basin is formed. After planting, spread a thin layer of compost on top of the soil to help conserve moisture and to supply some nutrients. Do not fertilize the newly planted tree until it has been vigorously growing for a couple of months. Mangoes do well on a grass watering schedule. An occasional deep soaking will help the tree fend off salt burn and encourage the roots to grow more deeply. Basin and sprinkler irrigation are both suitable for mangoes. As mentioned above, an occasional deep soaking will benefit mango trees grown in the lawn. Mulch/compost is very beneficial to mangoes. I keep a constant layer of yard waste, a couple inches thick, around the base of my trees to supply them with steady nutrition and help keep the soil moist. I even like to dump some of my grass clippings, straight out of the lawn mower basket, around my trees. Just be careful not to put down stuff this green too thick because it can actually get hot as it breaks down and will burn your trees roots. When I trim branches in the yard, and rake leaves, it goes straight to the bases of my trees. Mangoes are very sensitive to soil salinity. Since the Phoenix area water is already high in salts, the safest thing to do is to not use any chemical nitrogen fertilizers. 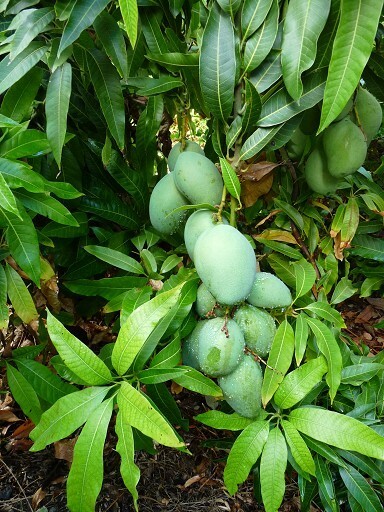 A mango short of nitrogen will look a paler green on both newer and older leaves. During the warm and hot months, regular (every 2 weeks in hot weather) applications of fish emulsion 5-1-1 will supply nitrogen and promote steady growth. Fish emulsion 0-10-10 should also be used to supply potassium and phosphorus. I like to mix a cap full (cap from the bottle) of each one of these into a gallon of water and pour the whole gallon around each tree underneath the canopy, avoiding getting too close to the trunk. I rarely use chelated iron on my mangoes, but when I do I use EDDHA in the soil or a foliar fertilizer on the leaves. I have also found that an occasional feeding of manganese sulfate can do wonders when the plant seems stubbornly chlorotic and chelated iron does not seem to work. There are two main families of mangoes, the Indian family and the Southeast Asian family. Indian Mangoes are monoembryonic, meaning there is only one plant in each seed and it is a cross between its parents, so it will not be a clone of either of its parents and will have unique fruit. Therefore, to grow an Indian mango tree, that has exactly the same fruit as its parent, the tree has to be grafted. Southeast Asian mangoes are polyembryonic, meaning each seed has a number of plants inside of it and the majority of these plants are actually clones of the parent tree. So, a S.E. 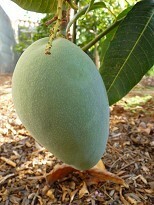 Asian mango has a good probability of coming true from seed. In fact, recently, Manila mangoes sold locally in Phoenix that originate from the La Verne nursery in California are being sold as seedlings. It is unclear if the nursery has some way of telling which seedlings are clones or whether they are gambling with their customers. I have tried a mango from one these trees and it was very good. Perhaps there is something special about Manila mangoes in this regard and they always come relatively true from seed. Mango trees can of course be grown from the seed of a mango that you just ate. While this is a little bit of a gamble, I have had great results doing just that. The big benefit of seedlings is that they are much more vigorous than grafted plants and therefore are more likely to power through our extreme heat and frosty nights. Seedlings will generally take longer to fruit than grafted trees, typically taking up to eight years to fruit. Pictured below is a fruit from my seedling mango tree, which is of Indian parentage. I have named this variety Keller, after my family name. Another benefit of growing a seedling is that you can name it anything you want. :) The fruits are large, delicious, and fiberless. This tree took 8 years from seed to produce its first fruit, but now gives me a large crop when not beaten back too much during the winter. It is currently 13 years old. Leafhoppers like mango trees but do not cause any significant problems, so they can be more or less ignored.